Greenspan: My Faith In Banks A "Mistake"
Former Federal Reserve Chairman Alan Greenspan says the current financial crisis has uncovered a flaw in how the free market system works and that has shocked him. Greenspan told the House Oversight Committee on Thursday that his belief that banks would be more prudent in their lending practices because of the need to protect their stockholders had proven to be wrong in the latest crisis. Greenspan said he had made a "mistake" in believing that banks in operating in their self-interest would be sufficient to protect their shareholders and the equity in their institutions. Greenspan said that he had found "a flaw in the model that I perceived is the critical functioning structure that defines how the world works." He bluntly called the current financial crisis is a "once-in-a-century credit tsunami" which will have a severe impact on the U.S. economy, driving unemployment higher. Asked if the White House agreed with Greenspan, Press Secretary Dana Perino said, "I think that is right." Perino added more grim assessments, saying, "we're in for a rocky road on the employment front and we expect our GDP number next week not to be a good one. And the next quarter could probably be tough as well. Greenspan, who headed the U.S. central bank for 18½ years, said that he and others who believed lending institutions would do a good job of protecting their shareholders are in a "state of shocked disbelief." He said that the current crisis had "turned out to be much broader than anything that I could have imagined. The committee called Greenspan to testify along with former Treasury Secretary John Snow and Securities and Exchange Commission Chairman Christopher Cox as lawmakers sought to discover if regulatory failings had contributed to the crisis. House Oversight Committee Chairman Henry Waxman said that he believed that the Federal Reserve, which regulates banks, the SEC and the Treasury had all played a role in contributing to the mistakes. "The list of mistakes is long and the cost to taxpayers is staggering," Waxman, a Democrat, told the three men. "Our regulators became enablers rather than enforcers. Their trust in the wisdom of the markets was infinite. The mantra became that government regulation is wrong. The market is infallible." In his testimony, Greenspan blamed the problems on heavy demand for securities backed by subprime mortgages by investors who did not worry that the boom in home prices might come to a crashing halt. "Given the financial damage to date, I cannot see how we can avoid a significant rise in layoffs and unemployment," Greenspan said. "Fearful American households are attempting to adjust, as best they can, to a rapid contraction in credit availability, threats to retirement funds and increased job insecurity." Also Thursday in a separate hearing, the head of the government's $700 billion financial rescue program told Congress the Bush administration has made "tremendous progress" in pushing to get it implemented. Neel Kashkari, a Treasury Department official who is interim head of the program, told the Senate Banking Committee in prepared testimony that since last week's announcement that the government would spend $250 billion to buy bank stocks to bolster capital reserves, there has been "numerous signs of improvement in our markets and in the confidence in our financial institutions." Sheila Bair, chairman of the Federal Deposit Insurance Corp., told the same Senate panel that the government needs to do more to help tens of thousands of home borrowers avert foreclosure, including setting standards for modifying mortgages into more affordable loans and providing loan guarantees to banks and other mortgage services that meet them. "Loan guarantees could be used as an incentive for servicers to modify loans," Bair said. "By doing so, unaffordable loans could be converted into loans that are sustainable over the long term." The FDIC is working "closely and creatively" with the Treasury Department on such a plan, she said. A report showed the number of homeowners ensnared in the foreclosure crisis grew by more than 70 percent in the third quarter of this year compared with the same period in 2007, according to data released Thursday. Nationwide, nearly 766,000 homes received at least one foreclosure-related notice from July through September, up 71 percent from a year earlier. Meanwhile there was more distressing news for the economy as layoffs continue to mount. Chrysler announced another 1,800 job cuts, reports CBS News business correspondent Anthony Mason. "The economy's so bad that nobody's buying cars," Kevin McWilliams told CBS News. "So it makes it hard on everybody." Both hearings were expected to be contentious as lawmakers, already upset about having to vote for the biggest bailout in U.S. history, sought answers to what went wrong and try to determine why the government's rescue effort, which just cleared Congress on Oct. 3, already has undergone a radical overhaul. As both men spoke, Wall Street spent another session buffeted by volatility. Investors wrestled with their fears about the economy but also looked for bargains after two days of selling. While the Dow Jones industrials and Standard & Poor's 500 index rose sharply, a downdraft in tech stocks left the Nasdaq composite index with a loss. Greenspan said that a necessary condition for the crisis to end will be a stabilization in home prices but he said that was not likely to occur for "many months in the future." When home prices finally stabilize, Greenspan said, then "the market freeze should begin to measurably thaw and frightened investors will take tentative steps towards re-engagement with risk." Greenspan said until that occurs, the government is correct to move forward aggressively with efforts to support the financial sector. He called the $700 billion rescue package passed by Congress on Oct. 10 "adequate to serve the need" and said that its impact was already being felt in markets. Greenspan did not specifically address the criticism he is receiving now as being partly to blame for the current crisis. Greenspan's critics charge that he left interest rates too low in the early part of this decade, spurring an unsustainable housing boom, while also refusing to exercise the Fed's powers to impose greater regulations on the issuance of new types of mortgages, including subprime loans. It was the collapse of these mortgages and rising defaults a year ago that triggered the current crisis. In his testimony, Greenspan put the blame for the subprime collapse on over-eager investors who did not properly take into account the threats that would be posed once home prices stopped surging upward. 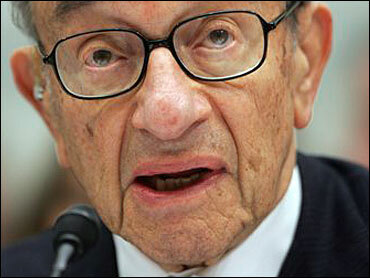 "It was the failure to properly price such risky assets that precipitated the crisis," Greenspan said.